Alrightayy. Today; Ann Demeulemeester, as promised. I enjoyed watching this show. 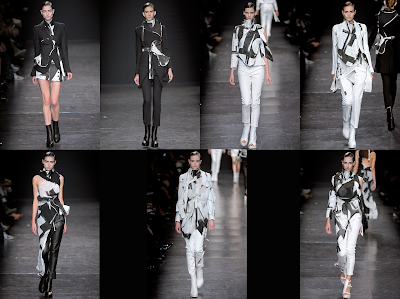 I liked the abstract graphic prints, and the interesting collar structures, whether they are made of fencing vests or just have fun designs. All of these pieces have something in common; graphic print. Even though these looks were spaced throughout the duration of the show, they all share the same print, whether it was a blouse, or just the accents. That first look (it's actually one of the first looks in the show) has one of my favorite pieces in it. I really enjoy the structure of this jacket. The base is a black, fitted jacket, but what really makes it interesting is the graphic printed collar and belt, as well as the fencing-jacket material details. One of the really cool things about this runway show, it is all black and white, which makes it so much more intense against the backdrop. It almost seems sci-fi to me, with the intense eyebrows, minimalistic makeup, and greased back hair on the models. Actually, it was dark and creepy enough, when I first saw it, fo me to think that some of the fencing jackets were straight jackets. There was some nice porportions in this show. I really liked the fact that a lot of the floor length dresses were made so only one leg is actually covered by fabric, so that when the models walk, the dress billows out like a wing. Very cool.